Kids often display incredible creativity on April Fools' Day -- but those particular creative efforts are not always welcome or appropriate! This year, help your students use their imaginations and channel their creativity in productive ways, with three new books written for just that purpose. Included: One book for upper-grade students and two for young kids, plus five Web sites for inspiring creativity. Creativity can be been defined as "the ability to transcend traditional ideas, rules, patterns, and relationships, and create meaningful new ones," Linda Leuzzi writes in A Creative Life: The Young Person's Guide. And that ability, she says, isn't just the province of the very bright or very talented. It's available to everyone willing to develop the "habits of the mind," that will allow them to extend their own abilities -- whatever they might be. That's right! According to Leuzzi, creativity is a matter less of nature and nurture than of focus and discipline. Everyone is good at something, she says. Creative people simply have cultivated certain characteristics that allow them to go beyond the ordinary in the pursuit of their interests. The characteristics of creativity described in Leuzzi's book, and bolstered by liberal quotes from such experts as Howard Gardner and Mihaly Csikszentmihalyi, include passion, curiosity, training, the art of listening, courage, commitment, persistence, flexibility, and humor. Leuzzi explains why those characteristics are important, how they can be developed, and how the (mostly self-imposed) impediments to their development can be overcome. More importantly, since this is a book for students in middle and high school, Leuzzi also discusses the art of integrity and issues of accountability. She explores the lives of director Ron Howard, artist Sam Maloof, and businesswoman Anne Roddick, pointing out that these creative and successful individuals "set their own courses, think deeply about their actions, and thrive in their creative work." Only the first part of A Creative Life is concerned with creativity in the abstract, however. Pointing out that "Something clicks when you watch a person's story unfold: an understanding of how the creative process works," Leuzzi devotes the second section of her book to exploring the lives of ten of her creative heroes. The stories of such creative individuals as actor Lou Diamond Phillips, chef Sylvia Woods, actor-playwright Charlayne Woodard, and luthier (stringed instrument maker) John Monteleone provide a unique look at the dedication, passion, and belief in their own abilities that enabled their creativity to flourish and led to their success. 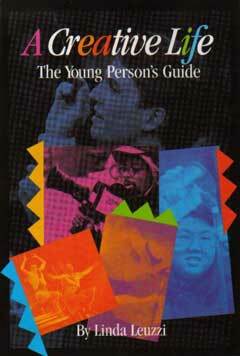 A Creative Life: The Young Person's Guide isn't an activity book containing exercises for toning the brain or sharpening the imagination. Instead, it is a book that will inspire students by demonstrating the characteristics that make creativity possible and by assuring students that they are capable of developing those characteristics in themselves. Younger students will be equally inspired by two new picture books, designed to help them use their imaginations to find magic in everyday items. 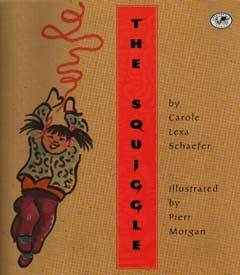 In The Squiggle, written by Carole Lexa Schaefer and illustrated by Peirr Morgan, a class sets off on a walk to the park, "in a bunched-up, slow, tight, straight line." Then the little girl at the end of the line finds a red squiggle on the sidewalk. Is it a rope? a string? a ribbon? We don't know. In the little girl's imagination, however, it's "the dance of a big scaly dragon," "the path of a circus acrobat," "the sky trail of popping fireworks." In the end, the squiggle becomes a line -- a line that was once slow, tight, and straight -- walking to the park. The Squiggle is a story of few words, but those words are rich in imagery. The illustrations, which almost glide across the shiny brown paper, add to the fantasy. And if the book inspires your students, the inside back and front covers provide four imaginative activities to help you extend the experience. Just Imagine, written by Deanne Lee Bingham and illustrated by Halina Below, is an equally simple story, one that's sure to tap into the imaginative powers of the very young. In this book, a young girl named Quin finds an old stick and turns it into a great adventure. In Quin's hands, the stick becomes a baton for conducting an orchestra, a wand for taming a tiger, a hose for dousing a fire, a paddle for steering a kayak -- it becomes simply a magic wand, turning the mundane into the magnificent. The highly descriptive text tells the story that Quin is imagining. The brightly colored pictures show that story as well -- on one side of each spread. The other side of the page shows Quin as she is, a little girl in jeans and a T-shirt, playing with a stick. The juxtaposition is both fun and effective -- and sure to inspire your students to just imagine too! The three books highlighted this week are available in bookstores everywhere. If you are unable to locate the book you're looking for, ask your bookseller to order it for you or contact the publisher directly. A Creative Life: The Young Person's Guide, written by Linda Leuzzi, is published by Franklin Watts, a division of Grolier Publishing, 90 Sherman Turnpike, Danbury, CT 06816. The Squiggle, written by Carole Lexa Schaefer and illustrated by Peirr Morgan, is published by Dragonfly Books, a division of Crown Publishers, 201 East 50th Street, New York, NY 10022. 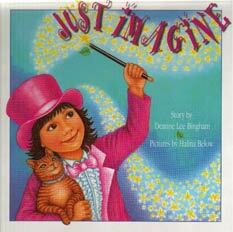 Just Imagine, written by Deanne Lee Bingham and illustrated by Halina Below, is published by Fitzhenry & Whiteside Limited, 195 Allstate Parkway, Markham, Ontario, Canada L3R 4T8.